These dazzling lights, called Triangle Light Objects or Transparent Light Origami, are rainbow-colored OLED panels that are evocative of stained glass windows. Created by Emory Krall for Universal Display, their hinged design makes them interactive – you can actually fold different colors over one another, creating new and exciting hues. So instead of buying multiple bulbs, you can achieve many different types of lighting depending on your mood with this one product. Check out a video of these TLOs in action here. 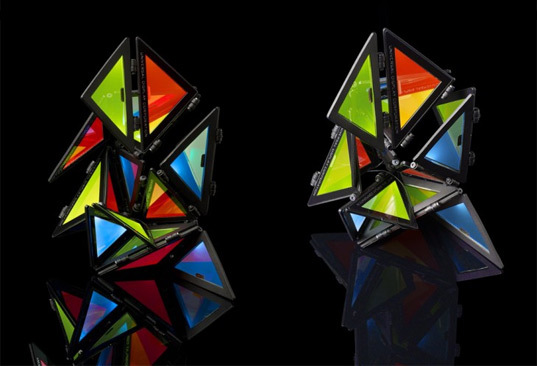 These dazzling lights, called Triangle Light Objects or Transparent Light Origami, are rainbow-colored OLED panels that are evocative of stained glass windows. Created by Emory Krall for Universal Display, their hinged design makes them interactive - you can actually fold different colors over one another, creating new and exciting hues. So instead of buying multiple bulbs, you can achieve many different types of lighting depending on your mood with this one product. Check out a video of these TLOs in action here.